Today I’d like to introduce a new design, the first in a series of designs to be released this autumn. 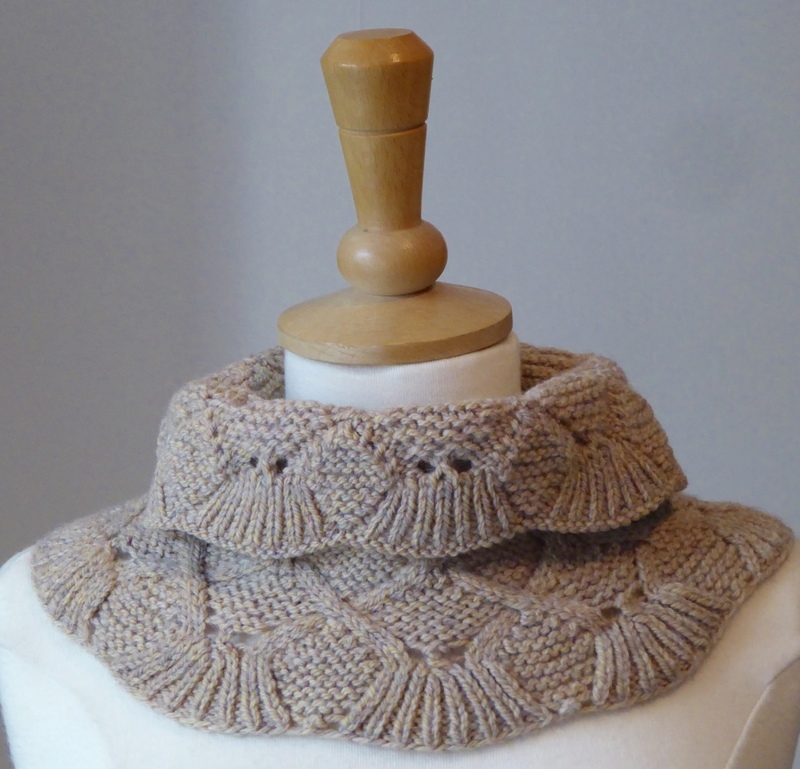 The cowl is knit in the round with a scalloped edge transitioning into cables that then merge into another scalloped edge at the top. I must admit I’m particularly pleased with these transitions. The samples pictured are knit in John Arbon Viola DK, an organically farmed merino spun in Devon. The colours are created by Canadian hand-dyer, Emily Foden (Viola) and John Arbon. I love how incredibly rich they are, an effect created by blending dyed tops prior to spinning. The yarn is worsted spun and this really showcases the depth of colour and creates an nice smooth yarn with body. 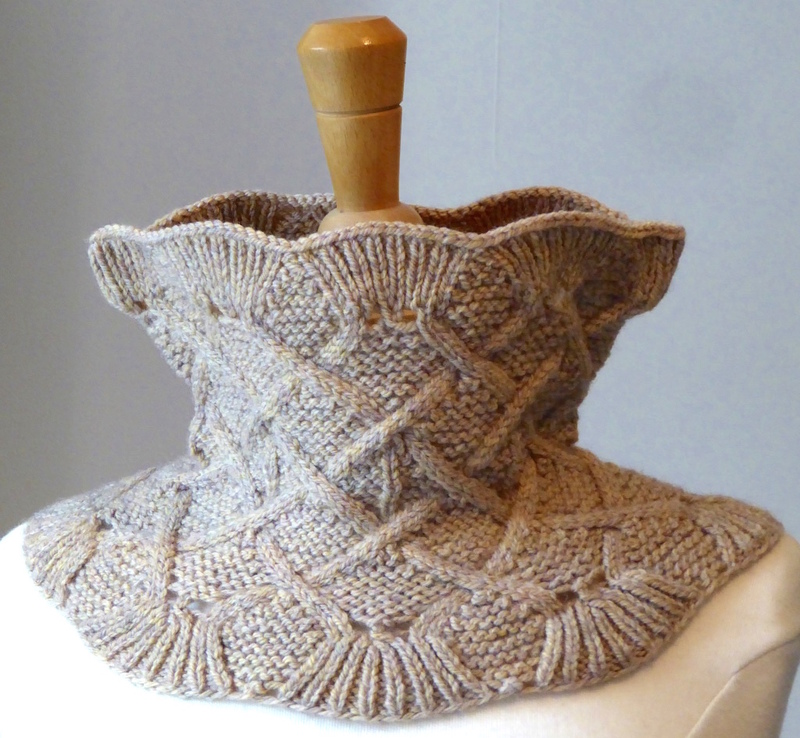 The cables look fabulous in this yarn which knits up into a wonderfully soft but also sculptural 3D textured fabric in this design. 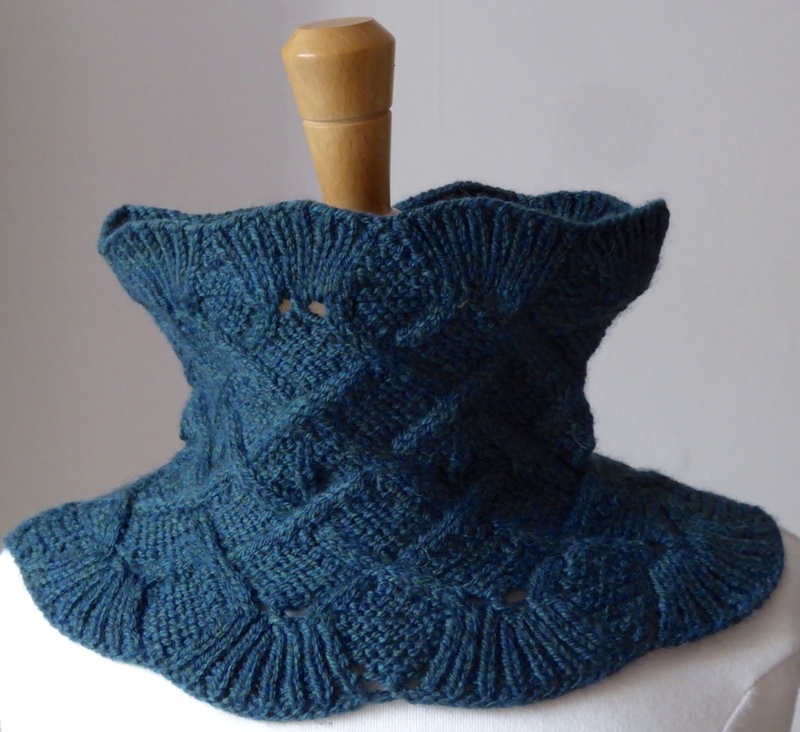 The pattern requires just one 100g skein – 250m, although if you knit to gauge you should be OK with 200m of yarn. It knits up on 4.5mm (US7) needles and the pattern provides fully charted and round by round written instructions. The cowl can be worn ‘up’ as shown above or you can fold it down which I think means you can transition from outside to inside without having to take it off every two minutes. The design also allows the fabric to open out over the shoulders so it sits nicely and there are no gaps where the wind can get in. 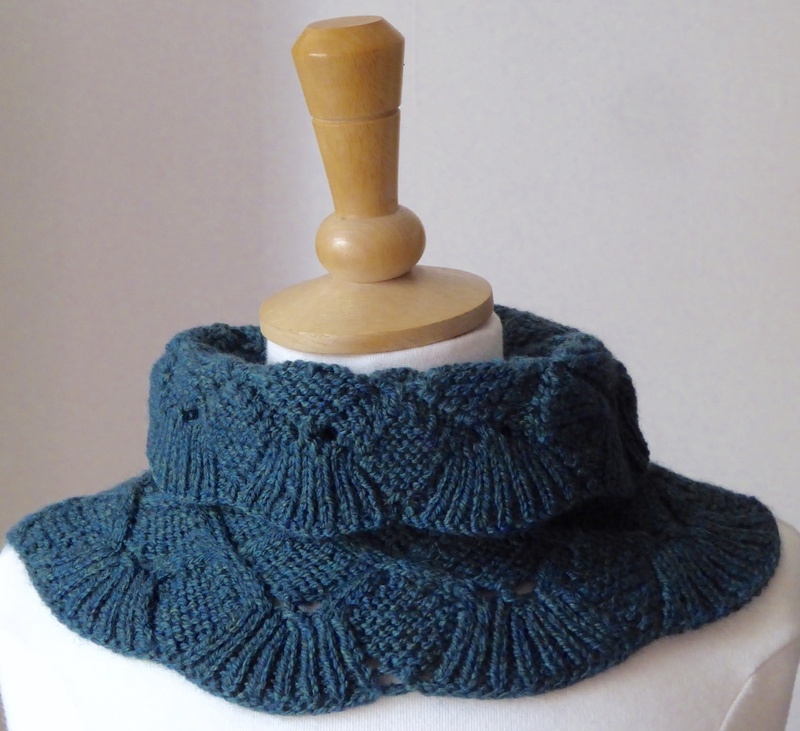 The pattern is available from Ravelry and, until midnight BST Saturday 14th October, can be bought at a discounted introductory price of £2.95 with the coupon code ‘solongsummer’. 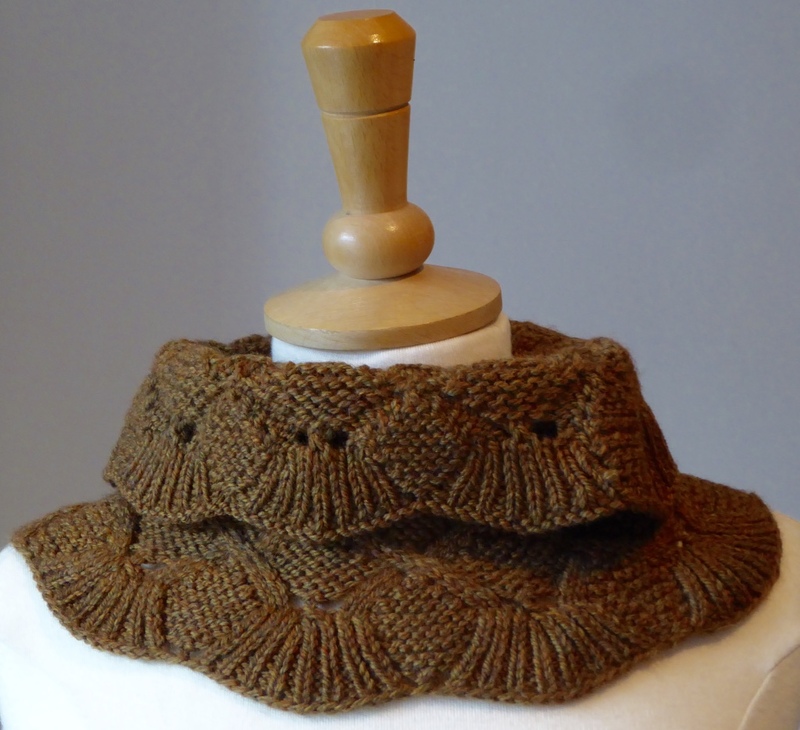 Please add the code to the Ravelry cart before proceeding to paypal to checkout. Moreover, despite fluctuating fortunes since the mid 1870s, The Red Lion continues as an Inn on the crossroads and you could re-create Ethelberta’s exit, and from here go exploring the surrounding countryside or study the geology as Hardy Suggests. Originally written for serialisation in The Cornhill Magazine in the mid 1870s, following the success of Far from the Madding Crowd, this is not regarded as one of Hardy’s great novels. It tells the story of a young woman, Ethelberta, a maid and the daughter of the butler who attracts the attentions of the son of the house, elopes with him, is married, only for her husband to die of a chill caught during their elopement. Her father-in-law follows his son in quick succession and her widowed mother-in-law takes her in as a companion and completes her education. Ethelberta then publishes a volume of poetry and is thus disinherited by her mother-in-law and left with just a house in London with an expiring lease. To support herself she becomes a professional storyteller and her charm and wit leads to a gathering group of admirers from whom she should choose to secure not only her own future financially, but also to support her extended family. Whilst some may question Ethelberta’s motives and suggest she is akin to a modern day gold digger, others read the novel as a critique of social class with a strong female protagonist who acts rationally and altruistically. At face value the novel deploys a number of approaches that Hardy regularly returns to, and which can divide readers, including parody of conventions, romance, melodrama and farce, and absurdism and surrealism. However, later critics have read the novel through a postmodern lens drawing attention to how Hardy blurs the boundary between reality and fiction thus questioning realist conventions, and placing exactly these divisive approaches to narrative including self reflexivity, parody and pastiche in a postmodern critique. The argument that this novel embodies the self-reflexivity which has become a characteristic feature of postmodern literature stems largely, and somewhat surprisingly given his approach to biography, from Robert Gittings. It was Gittings who, in his quite conventional two volume biography of Hardy published in the 1970s, first drew the parallels between Ethelberta and Hardy himself, arguing that Hardy chose to ‘project his own dilemma into that of a woman’ since ‘It would be too near home in all sorts of senses to make this chief character a male author’ (p.290). In making this argument he draws on his biographical knowledge of Hardy’s roots and the social status of his family which mirror that of Ethelberta, showing how they both straddle lower and middle classes at a time where this was not socially acceptable. This leads Gittings to conclude that ‘Hardy’s farewell to the class in which he had been brought up, and his reluctant satire on the class he was now to enter, made this novel, as the critics found it, a ‘deliberate oddity’ (p.296). As such, the novel largely fails to be the ‘frivolous’ comedy of manners or domestic melodrama that it’s preface proclaims and much of it’s set up suggests. Instead it critiques the transactional nature of marriage with which we are familiar from Jane Austen’s Pride and Prejudice (1813) and which still persisted. Moreover, we also see a strong, unconventional woman negotiating the traps society laid for women at this time. She is determined, she is focussed, and she does not succumb to the type of tragedy or misfortune that befalls so many of Hardy’s female characters who challenge social mores, hypocrisies and taboos.